Simply put, contamination occurs when non-recyclable materials (like plastic bags) get into the recycling system or when recyclable materials are prepared in the wrong way. In many cases, having contaminants mixed in with acceptable recycling means the entire load goes to the landfill — recyclables and all. In other words, one bad apple can – and does – spoil the whole bunch. What are the most common recycling contaminants? To help ensure that your materials get recycled, keep these contamination offenders out of your recycling bin. Contaminant: Plastic Bags. Plastic bags and their cousins — shrink wrap, bubble wrap, Ziploc bags, produce bags, trash bags and so on — are the worst contaminants of all. They jam the recycling machinery and create a hazard for the sorters, costing time and money — only to end up in the landfill. Here’s a short video showing the problems plastic bags can cause at recycle sorting facilities. Contaminant: Food Waste. If the items being recycled contain food waste, oil or grease, they’re contaminated, and will go to the landfill — even if it’s something that could otherwise be recycled, like tin cans. That’s why pizza boxes are now considered contaminants. Contaminant: Glass. Glass bottles and jars can’t go in the commingled recycling bin because they break and contaminate the entire bin. Instead, you can now recycle your clean glass containers — any color, up to one gallon in size — at the Transfer Station. 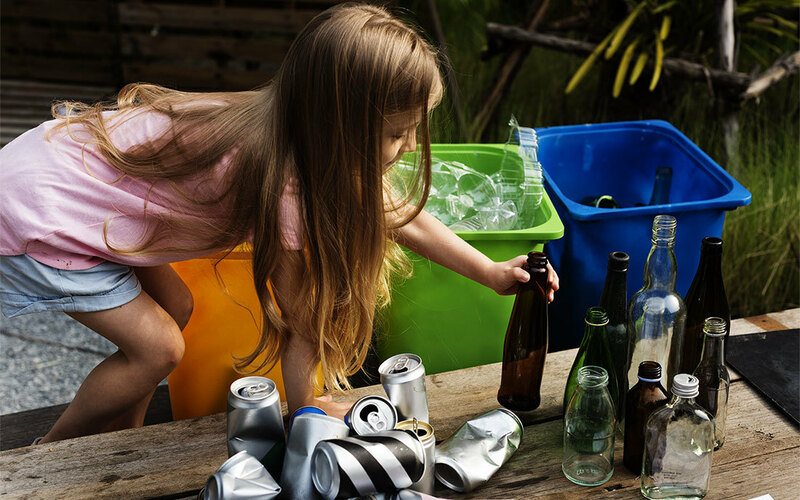 You can also drop off glass bottles and jars for recycling at several local grocery stores. Or return them to the Medford BottleDrop Redemption Center where redeemable glass, plastic and metal beverage containers are worth 10¢ each thanks to a recently expanded Bottle Bill. Contaminant: The Wrong Plastics. You can recycle milk jug style plastic containers in your red-lid recycling cart. But that’s currently the only type of plastic we accept. The reason? Milk jugs and milk style jugs made from a type of plastic called High-Density Polyethylene (HDPE) are still in demand — because of their resin type and their shape. Beyond that, the markets for many other plastics are unstable and most waste plastics are being landfilled. Contaminant: Hazardous Waste. Containers for paint, motor oil, pesticides, pool chemicals and other household hazardous wastes must be disposed of separately. Not only can they not be recycled, they don’t go in the trash either. Every spring, Rogue Disposal & Recycling hosts a Household Hazardous Waste Drop-Off Event. Learn more here. Contaminant: Bio-Hazardous Waste. Diapers, sanitary products or anything else with human fluid on it is potentially dangerous to handle and cannot be recycled. Tossing these items into a recycling bin means the whole load goes to the landfill. These items go in the trash. Contaminant: Frozen and Refrigerated Food Boxes. These boxes and cartons may seem like they’re made from paper, but they’re not. The specially treated boxes used for frozen foods, soup, juice and milk are actually made from a combination of paper, plastics and sometimes metal, designed to hold moisture inside the carton. During the recycling process, the materials don’t break down into recyclable materials, so they contaminate everything else they’re with. These boxes are designed for food safety, not for recyclability. Contaminant: Styrofoam. Polystyrene — the material in Styrofoam — is 99% air. It’s cost prohibitive to collect and compact the volume needed to ship to a processor. And in the recycling bin, it’s a contaminant. Recycling contaminants can do harm in a variety of ways. Here are some of the problems caused by contaminants. Damage to Machinery. Plastic bags can wrap around the shafts and axles of a sorting machine and endanger the sorters who have to remove them. When the machine breaks down and the sorters have to dig the plastic bags out, time and resources are wasted. Unsafe Working Environment for Sorters. When non-recyclable items contaminate a load, recycling workers can be exposed to hazardous waste, vector-borne diseases (living organisms that can transmit infectious diseases between humans or from animals to humans), and other physically damaging items. Loss In Value for Recyclables. The cardboard, newsprint, plastic, and metal items you toss into your recycling cart have value, aside from the intrinsic value benefitting the planet. When the recycling cart contains contaminants, the quality of the recyclable materials — and the market value for the recyclables — is reduced or eliminated. Damaged Market Relationships. When a recycling facility continually gets loads with non-recyclable or contaminated materials, they can refuse service to repeat offenders. Or worse, they can stop taking certain kinds of materials altogether. When this happens, otherwise good materials that could be recycled end up in the landfill because no one wants them. How can you help reduce contamination and increase recycling? Here are a couple of easy steps. Ask Questions. Not sure if you can put milk jugs (you can) or margarine tubs (you can’t) in the recycling bin? Ask us. Enter the name of anything you want to recycle into our waste disposal guide and you’ll get a quick answer. Need more information? Use the search mechanism on our website, or give our Customer Service team a call at 541.779.4161. Sort Thoughtfully. What stays out of your recycling cart is just as important as what goes in. Corrugated cardboard, newspaper, milk jug style containers, and tin and aluminum cans can all be tossed into your curbside cart. You can also recycle all those same items — plus clean glass bottles and jars (any color, up to one gallon in size) and high-grade office paper — at the Transfer Station. Or take your glass containers to a Rogue drop-off at area grocery stores or to the BottleDrop Redemption Center. But they have to be sorted separately in order for them to find recycling markets. Some of the "most found" contaminants in the recycling bin include plastic bags and soft plastics that tangle the sorting equipment, other plastics (like food trays and clamshell containers) that have never been allowed in curbside carts, and garbage - including food and clothing. Keep It Clean. The cleaner the materials, the more likely they are to be recycled. Before you throw that tin can into the cart that still has refried beans in it, think of the person at the recycling center that will have to handle numerous recyclables covered in muck. Not only is it a nasty mess, but it can ruin an entire load of recyclable materials. So be sure and scrape food and rinse any containers before they go into your cart. Despite the current challenges finding markets for commingled recycling materials, Rogue Disposal & Recycling remains committed to protecting the health and welfare of the residents of the Rogue Valley by providing environmentally sound solid waste management services. Keeping contaminants out of the recycling stream is a great place to start.